BY THE TIME HE WAS TWENTY-FIVE YEARS OLD, JACOB MARATECK HAD BEEN SENTENCED TO DEATH THREE TIMES — YET LIVED TO TELL ABOUT IT. THIS BOOK IS HIS STORY, TOLD WITH THE SAME SENSE OF HUMOR THAT HELPED HIM SURVIVE. 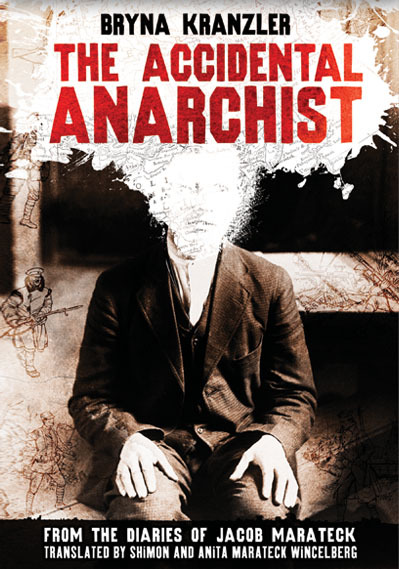 The Accidental Anarchist is the remarkable, true story of an ordinary man who gets caught up in the history-making events of the early 1900s in Russia. Follow Marateck, in this historical biography, as he leaves home at age 13 seeking “great adventure,” organizes a workers’ strike in Warsaw, gets conscripted into the notoriously anti-Semitic Russian army and earns his 1st death sentence, becomes a non-commissioned officer during the Russo-Japanese War (which meant that the men under his command wanted to kill him at least as much as the enemy did) and earns his 2nd death sentence, and joins the incompetent Polish revolutionary underground to overthrow Czar Nicholas II and earns his 3rd death sentence. While his sentence is commuted to merely ten years of hard labor in Siberia, Marateck escapes, along with Warsaw’s colorful “King of Thieves.” Together this unlikely pair travels nearly 3000 miles home, without food, money or legal papers, while dodging Cossacks and the secret police. Despite poverty, starvation and the horrors of war, Marateck never loses his faith, his sense of humor, or the optimism that helps him survive.